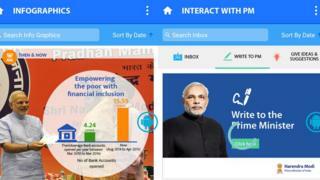 Technology writer Krish Raghav reviews the Narendra Modi mobile app, unveiled by the Indian prime minister in June. There is a lot of swiping in the new app, also called Narendra Modi (Google Play Store, free). You swipe up to reveal new instructions. Swipe down to refresh the app's feed. Swipe left to approve of his government's new schemes, and swipe right to find new schemes to approve by swiping left. It is like Tinder (the international dating app) for good governance, except all you can do is approve, and share your approval. Often, you're not even sure what you're approving. The first question in the app's "Poll" section just asks: "Which of the following government initiatives do you think has had the most." The most what? All that matters is that you approve of the question, and tell your 900 Facebook friends, like I did, that you strongly believe that the Swachh Bharat Abhiyan (Clean India campaign) has "had the most". The app has a quiet desperation to it, a weakly repetitive insistence that you share, share, share. You cannot even read your daily Modi news without logging in via Facebook, Twitter, Google+ or your Narendra Modi account (presumably the app's target demographic), and the little green "Share" button is the only consistent element in the app's otherwise confused design ethos. A simple Modi-centric aggregator, built to amplify the well-oiled social media machine his campaign pioneered. Grafted to that, a one-stop shop for Modi news and updates, culled from his many productive online channels. You can listen to old episodes of the PM's weekly radio show, or read all the (positive) media coverage he is receiving. I was expecting all that. What I was not expecting was a videogame. "Earn points and win badges" is one of the first things the app tells you about itself. "Badges come with recognition and increased responsibility." "Earn them all and establish yourself as a true changemaker." This is where things get both clever and insidious. The app "gamifies" your approval of the government's policies - giving you the incremental opiate buzz of points ticking upwards and badges awarded. As a gamer, this opened some kind of ancient competitive gristle in my mind. I had 10 points, the app told me. Get 80, and I'd be awarded the "Pro Active" badge. There are two ways to earn "points" - approve of the government's policies (by "Liking" posts) and share them (by posting articles from the app on your own feeds). I got right into it. I answered the aforementioned poll question for five points. I Liked a post about Mr Modi attending a World Yoga Day rally for two points. I shared his lecture at the Dhaka University earlier in June for two points. And that was it. Nothing left to approve. "Stay tuned!" the app said cheerfully. "Contribute by [showing] support towards various policies." I was stuck at 19 points, 61 short of that "Pro Active" badge. Desperate for policies to approve. I consoled myself by reading some of the app's other content - episodes from Mr Modi's life, written with breathless reverence. I learnt that he was a "Man of Organisation", who had "mastered the Art of Governance". I pored over Charts and Infographics (literally, because you can't zoom into them) flanking articles about the government policies, written like press releases. The app has a decent reading interface with a thoughtful layout that lets you filter for photos, charts or embedded videos. With nothing else to do, and no apparent way to earn my badge, I stumbled upon the "Give Feedback" section of the app. I remembered its insistence that I "contribute" in whatever way I could, and I considered writing a thoughtful critique of the videogame component, and how its points economy was fundamentally broken. But I couldn't be bothered. After all, I couldn't even get my "Pro Active" badge. So how much would I give this app? Two stars.